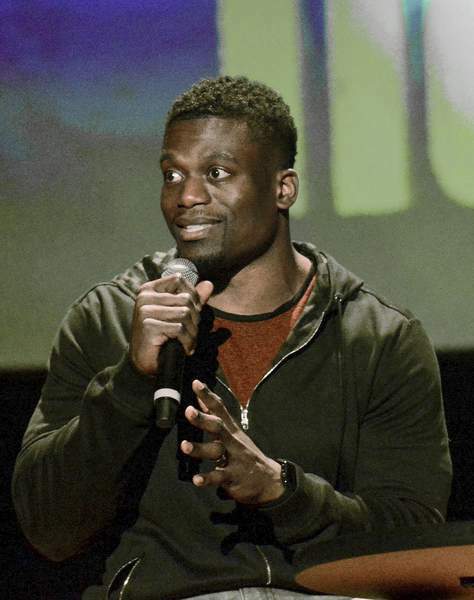 Michelle Davies | The Journal Gazette Ravens tight end Benjamin Watson addresses Monday night’s Fellowship of Christian Athletes’ Night of Hope at Embassy Theatre. Benjamin Watson explained he didn’t know how to make a Facebook post. The crowd Monday night at the Embassy Theatre laughed at that lack of social media savvy as Watson shared a story from two years ago. It was the story of when he first learned the grand jury’s decision in the case of Michael Brown, who was shot by a police officer in Ferguson, Missouri. Watson, an NFL tight end, was sitting in his car in a Target parking lot while his wife shopped for groceries. The New Orleans Saints had just lost at home to the Baltimore Ravens on ESPN’s "Monday Night Football." But Watson’s mind was less on his team’s loss and more on the latest developments in an incident he had followed closely on Fox News and CNN. Watson typed his thoughts in a notebook application on his phone and forwarded them to someone else to post on his Facebook account. That decision eventually led to an essay gone viral, to Watson writing a book titled "Under Our Skin: Getting Real About Race" and to his appearance in Fort Wayne at the Fellowship of Christian Athletes’ Night of Hope. "I remember them deciding not to indict the officer and feeling so much emotion," Watson said at the Embassy. "What I do sometimes is write. I (wrote) about being frustrated and sad, about being hopeful because I see the progress made in this country on race." What Watson ultimately came to realize, what he would make the theme of his book and ensuing public speeches, is that anything believed to be a racial problem is in actuality a "sin problem." "As believers (in God), we have an answer the world does not," Watson said. "One of the biggest divides we have is the difference in experiences. We have to address our loyalties. Our loyalty is not to our grandparents, the traditions, our volleyball team, our friends; as believers, our loyalty is to Scripture." Watson, who signed with Baltimore this offseason in free agency, said that in God "we are one." He said racial tensions and frictions are not an issue for laws to solve or for government action to solve. "Ultimately, it’s a heart issue," the 35-year-old native Virginian said. "It’s a heart issue. You can’t legislate morality or legislate the heart. Only God can do that." Watson spoke for nearly 40 minutes and, in a lighter moment, explained the contrast in playing for two super­star quarterbacks during his 13-year career, New Eng­land’s Tom Brady and the Saints’ Drew Brees. "You turn on the TV and see Tom Brady yelling at everybody," Watson said. "They lead differently. Drew is not the rah-rah guy. That’s just not who he is. I’m fortunate to have played for both." Watson had a career year in 2015 with 74 receptions for 825 yards and six touchdowns. But he’s since become a vehicle for more discussions than just those involving fantasy football. "The challenge is to call it as sin," Watson said. "Sometimes we say, ‘Oh, they’re black, I don’t really like them,’ or ‘All the white people are out to get me; I can’t stand them.’ Our earthly distinctions, God created. The reason we have power to live free from sin is his blood. His blood is what unites us."